These days, you hear a lot about ‘return on investment’ (ROI) or ‘payback time’. These are ways of expressing both how long it will take you to recoup your up front investment in a product or service and what sort of return you can expect after having recouped your initial investment. 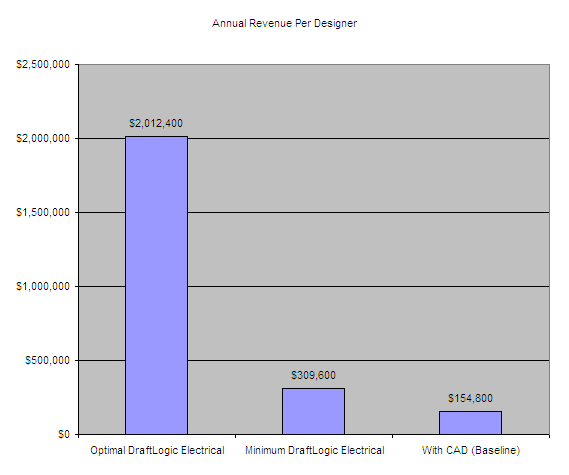 DraftLogic Electrical is amazing by any measure of ROI or payback time. We conservatively estimate that DraftLogic Electrical will make its users twice as effective. In reality, our benchmark test proved a productivity gain of thirteen times on a typical school drawing. So for your engineering stars that generate 150K+ in billing per annum, we empower them to produce a minimum of 300K+ and up to two million per annum—a payback time of a month at most per seat and a first year ROI of 1200% to 18500%! Like the AutoCAD it is built upon, DraftLogic Electrical is sold per seat. Although we do not currently have a network license server, we are more than happy to piggyback on your AutoCAD license server or make other arrangements to match your DraftLogic Electrical license count to your user pool. DraftLogic Electrical can be used by paying a monthly fee or via outright purchase. The DraftLogic Electrical 'pay-as-you-go' option allows you to pay for use of our productivity accelerating software as you go rather than up front. Your commitment is purely for one month, you can cancel at any time by simply not renewing your monthly license. There is no annual maintenance fee on the pay-as-you-go program, and you have up to five free support incidents per year. Combine this with our free video training program, and you have a low out-of-pocket way of over doubling your design productivity! The monthly fee is $475, payable in advance of the month of use. Keep your DraftLogic Electrical license active by renewing prior to the expiration of the month. You can convert 100% of your pay-as-you-go fees for the most recent 12 months toward an outright purchase. The cost per seat is $9,950, with an annual maintenance requirement of $1,800 per year. The first maintenance payment is due by the one year anniversary of original purchase. The annual maintenance fee pays for ongoing use of the software plus any maintenance releases. Licenses for new products (i.e. a new and separate application) or new versions of existing products that include material new functionality are not included in the maintenance fee. For our North American clients, DraftLogic invoices at net 0-30 days depending on your purchase size and product/service mix. All license purchases, training attendee costs, and maintenance fees will be invoiced at net 30 days terms. Training disbursements will be invoiced net 0 unless other arrangements are made. After the net terms days are expired, all accounts will either be charged 2% per month interest on overdue amounts or have their licenses terminated at DraftLogic’s discretion. International accounts (i.e. outside the United States and Canada) are all on a prepaid basis. Funds must clear DraftLogic's bank prior to goods or services being delivered. In order to ensure that all our users can take full advantage of what DraftLogic Electrical offers, training is compulsory. There are three training methods to choose from: self-training using our training videos and manual (with our support for questions via phone/email/WebEx), classroom based training, or training via WebEx. For the classroom training, users can come to our offices for training or we can come to yours. From time to time we may also offer training sessions at central locations in North America to minimize travel for new users from several different companies. Training is a full three days and that does not include any breaks for checking in on regular work. We thus strongly recommend that attendees be sequestered away from their regular work to ensure they can focus on the training session. The cost of the training per user at our site or via WebEx is $1,800. At central locations the cost will be somewhat higher to cover our facilities and travel costs. To have a session run at your offices for one to six users, the cost is $4,950 plus any disbursements at cost (meals, accommodations, travel). There is no charge for self-training using the videos and manual that we will supply electronically. Your initial purchase and annual maintenance include five free support incidents per year. As per our counterparts in delivering software support, we define an incident as assisting you with one particular question/issue regardless of how much or little of our time it takes to resolve that question/issue. Extra support incidents will be billed at $95 per incident. If you prefer to lease DraftLogic Electrical, DraftLogic will be assist you in working with a leasing company of your choice or will help you to find one. For example, it would be $434.50 a month for five years (end total $26070.12 at 10% interest) for DraftLogic Electrical+Training+Five Years Maintenance versus doing it all cash out of pocket of $11450 up front and $1800 a year (end total $20450). Your monthly and total outlays under a leasing program would be less, of course, if we can make leasing arrangements at lower than 10% with a leasing company you have a relationship with.